In vertebrate development, the sequential and rhythmic segmentation of the body axis is regulated by a “segmentation clock”. This clock is comprised of a population of coordinated oscillating cells that together produce rhythmic gene expression patterns in the embryo. Whether individual cells autonomously maintain oscillations, or whether oscillations depend on signals from neighboring cells is unknown. Using a transgenic zebrafish reporter line for the cyclic transcription factor Her1, we recorded single tailbud cells in vitro. We demonstrate that individual cells can behave as autonomous cellular oscillators. We described the observed variability in cell behavior using a theory of generic oscillators with correlated noise. Single cells have longer periods and lower precision than the tissue, highlighting the role of collective processes in the segmentation clock. Our work reveals a population of cells from the zebrafish segmentation clock that behave as self-sustained, autonomous oscillators with distinctive noisy dynamics. The timing and pattern of gene activity in cells can be very important. For example, precise gene activity patterns in 24-hour circadian clocks help to set daily cycles of rest and activity in organisms. In such scenarios, cells often communicate with each other to coordinate the activity of their genes. To fully understand how the behavior of the population emerges, scientists must first understand the gene activity patterns in individual cells. Rhythmic gene activity is essential for the spinal column to form in fish and other vertebrate embryos. A group of cells that switch genes on/off in a coordinated pattern act like a clock to regulate the timing of the various steps in the process of backbone formation. However, it is not clear if each cell is able to maintain a rhythm of gene expression on their own, or whether they rely on messages from neighboring cells to achieve it. Now, Webb et al. use time-lapse videos of individual cells isolated from the tail of zebrafish embryos to show that each cell can maintain a pattern of rhythmic activity in a gene called Her1. In the experiments, individual cells were removed from zebrafish and placed under a microscope to record and track the activity of Her1 over time using fluorescent proteins. These experiments show that each cell is able to maintain a rhythmic pattern of Her1 expression on its own. Webb et al. then compared the Her1 activity patterns in individual cells with the Her1 patterns present in a larger piece of zebrafish tissue. The experiments showed that the rhythms in the individual cells are slower and less precise in their timing than in the tissue. This suggests that groups of cells must work together to create the synchronized rhythms of gene expression with the right precision and timing needed for the spinal column to be patterned correctly. In the future, further experiment with these cells will allow researchers to investigate the genetic basis of the rhythms in single cells, and find out how individual cells work together with their neighbors to allow tissues to work properly. Populations of coordinated oscillators occur in a variety of biological systems. Examples include the rhythmic flashing of fireflies, the spiral aggregation of microbes, and the daily oscillation of circadian clocks in nearly all organisms. Communication between the individual oscillators can influence whether oscillations are maintained, i.e. their persistence, as well as their period and their precision. Without examining the properties of an individual in isolation from its neighbors, a state that we define as autonomous, it is challenging to assign the relative contribution of individual and collective processes to the observed rhythmic behavior of the population. During vertebrate embryogenesis, coordinated genetic oscillations occur in a population of cells in the posterior-most tissues of the body axis, the tailbud and presomitic mesoderm (PSM). These oscillations generate a rhythmic spatial pattern. This “segmentation clock” is thought to subdivide the embryonic body into morphological segments, called somites, which arise rhythmically and sequentially from the PSM. Persistent oscillating gene expression within the tailbud and PSM corresponds to segment formation in chick, mouse, and zebrafish (Palmeirim et al., 1997; Dequéant et al., 2006; Krol et al., 2011). Looking across biological systems, persistent and coherent rhythms in a population can be the product of synchronized cell-autonomous oscillators, or alternatively can be the outcome of population-level coupling of otherwise non-oscillatory cells. The autonomy of circadian clock neurons was demonstrated by recording daily oscillations in firing rate and gene expression from single cells for several cycles in the absence of their neighbors (Welsh et al., 1995; Webb et al., 2009). In contrast, some microbial systems have been shown to produce oscillations only when at critical densities that allowed cell-to-cell communication, otherwise the isolated cells were not rhythmic (Gregor et al., 2010; Danino et al., 2010). Therefore, to test for autonomy of cellular oscillators in the segmentation clock, it is imperative to determine whether individual cells can oscillate in the absence of signals from their neighbors. Historically, the term autonomy has appeared many times in the segmentation clock literature, starting with the observation that gene expression in explanted PSM can oscillate in the absence of neighboring tissues (Palmeirim et al., 1997; 1998; Maroto et al., 2005). This means the PSM is autonomous at the tissue level. The question of whether individual segmentation clock cells are able to oscillate autonomously, that is, when fully separated from the tissue, has been debated for decades. Early theoretical arguments explored this possibility (Cooke and Zeeman, 1976), as well as scenarios where coupling led to oscillations (Meinhardt, 1986). The possibility for an auto-regulatory negative feedback loop arising from the transcription and translation of members of the Hes/Her gene family would be consistent with a cell-autonomous mechanism (Hirata et al., 2002; Lewis, 2003; Monk, 2003), and oscillations in this gene family have been observed across vertebrate species (Krol et al., 2011). However, the discovery of oscillations in the Delta-Notch system in all vertebrates and in many genes of the Wnt and FGF intercellular signaling pathways in mouse and chick, raises the possibility that communication between cells may play a critical role in the generation and/or maintenance of the oscillations (Dequéant et al., 2006; Krol et al., 2011; Goldbeter and Pourquié, 2008). Two pioneering studies have attempted to address cellular autonomy in the chick and mouse segmentation clocks. In the first study, cells isolated from chick PSM, then cultured in suspension and fixed at subsequent time intervals, showed changes in cyclic gene expression (Maroto et al., 2005). Due to the unavoidable uncertainty in reconstructing a time series from static snapshots of different cells, the authors of this study were not able to distinguish between noisy autonomous oscillators and stochastic patterns of gene expression, and highlighted the need for real-time reporters to investigate the autonomy of PSM cells. In the second study, the first real-time reporter of the segmentation clock, a luciferase reporter of Hes1 expression in mouse, allowed individual mouse PSM cells to be observed in vitro (Masamizu et al., 2006). Three cells were reported, showing at most 4 expression pulses with variable duration and amplitude, which appeared to damp out. This study concluded that PSM cells may be “unstable” oscillators, and highlighted the role of intercellular coupling for maintenance of oscillations. Reflecting this, the authors modeled the cells as excitable systems dependent on noise or signals from their neighbors for pulse generation. Thus, the degree of autonomy of completely isolated cells from the segmentation clock in mouse and chick remains unclear. Working from the segmentation phenotypes of mutant zebrafish and the identity of the mutated genes, cases were originally made both for and against cell-autonomous oscillators in the zebrafish segmentation clock (Jiang et al., 2000; Holley et al., 2002). More recent results bring support to the idea of autonomous oscillators that are synchronized to each other. Treatment of zebrafish embryos with a γ-secretase inhibitor targeting the Notch intercellular domain (DAPT) leads to a loss of spatial coherence in oscillating gene expression (Riedel-Kruse et al., 2007). Additionally, imaging of individual cells in mutant embryos with reduced Notch signaling show that oscillations persist under these conditions (Delaune et al., 2012), though this does not rule out the possibility of Notch or other signaling factors playing a role in promoting oscillations. We recently developed an in vitro primary culture system to image gene expression in individual tailbud and PSM cells (Webb et al., 2014), allowing the possibility of autonomous oscillations to be tested directly. In this paper we measure the intrinsic properties of single zebrafish cells isolated from the segmentation clock in the tailbud and show that they behave as autonomous genetic oscillators in vitro, in the absence of cell-cell or tissue-level coupling. We observe a striking variability in the cells’ dynamics and find that a long-timescale noise in a theoretical description of the autonomous oscillator can account for this. We then ask how the behavior of these cell-autonomous oscillators compares to oscillations at the level of the intact embryo. It is thought that collective processes at cellular and tissue level influence the period of segmentation in zebrafish. Theoretical analysis of the collective behavior of many cellular oscillators with time-delayed coupling shows that this process can set a collective period in a synchronized population (Herrgen et al., 2010). This predicts that cells isolated from the tailbud will have a different period than the population. In addition, the precision of oscillation in a synchronized population can be higher than that of component oscillators (Herzog et al., 2004; Garcia-Ojalvo et al., 2004), and this scenario has been proposed for the segmentation clock (Masamizu et al., 2006). However, an alternative case of synchronized oscillators with the same individual precision as the population has also been considered for the segmentation clock (Horikawa et al., 2006). Knowledge of the period and precision of cells isolated from the segmentation clock should enable tests of these ideas. Using our autonomous oscillator data we characterize the period and precision of individual cells; we find that individual cells have a longer period and are less precise than the population in the tissue. Together, these results have implications for the pace-making circuit and the collective organization of the segmentation clock. To test whether single cells behave as autonomous oscillators requires a cyclic gene expression reporter and a primary cell culture system. The cyclic bHLH transcription factor Her1 has been proposed to act within a core negative feedback loop that drives oscillations (Holley et al., 2000; Oates and Ho, 2002; Schröter et al., 2012) and has previously been used to follow segmentation clock dynamics in the embryo (Delaune et al., 2012; Soroldoni et al., 2014). We used our transgenic zebrafish line Looping, which expresses a Her1-VenusYFP (Her1-YFP) fusion reporter driven from the regulatory elements of the her1 locus with accurate temporal and spatial dynamics in the embryo (Soroldoni et al., 2014). Although cells are thought to slow their oscillations as they leave the tailbud and differentiate in the PSM, progenitor cells in the tailbud are thought to maintain a regular rhythm throughout development (Delaune et al., 2012; Giudicelli et al., 2007; Morelli et al., 2009; Uriu et al., 2009; Ay et al., 2014; Shih et al., 2015). In search of these cells, we first explanted intact tailbuds from 8-somite stage embryos homozygous for the Looping transgene (n=3) (Figure 1A; Figure 1—figure supplement 1) into culture and recorded the Her1-YFP signal within a central region of the tissue. After local background subtraction, we generated time series of average intensities of the regions of interest, estimated period from inter-peak intervals and measured amplitudes for each cycle (Figure 1—figure supplement 2). We observed persistent Her1-YFP oscillations (Figure 1—figure supplement 3) that did not slow down (period 42.5 ± 11.4 min (mean ± SD) at 26°C) (Figure 1—source data 1). Zebrafish segmentation clock cells oscillate autonomously in culture. (A) Confocal section through the tailbud of a Looping zebrafish embryo in dorsal view where the dotted line indicates the anterior limit of tissue removed. Nuclei are shown in red and YFP expression in green. Scale bar = 50 μm. Kupffer’s vesicle (Kv), notochord (Nc), presomitic mesoderm (PSM), tailbud (Tb). (B) A representative 40x transmitted light field with dispersed low-density Looping tailbud-derived cells. Individual cells highlighted with black arrowheads; green arrowhead shows cell with green time series in (D). Scale bar = 10 μm. Pie chart: More than half of the in vitro population of Looping tailbud cells (n = 321 out of 547 cells combined from 4 independent culture replicates as described in Materials and methods) expresses the Her1-YFP reporter. Some expressing cells are disqualified because they move out of the field of view (4%), touch other cells by colliding in the field of view (12%) or following division (2%) for a total of 14%, or do not survive until the end of the 10-hr recording (7%). (C) Montage of timelapse images (transmitted light, top; YFP, bottom) of a single tailbud cell (green arrowhead in panel B) over 10-hr recording. Scale bar = 10 μm. (D) YFP signal intensity (arbitrary units) measured by tracking a regions of interest over 3 single tailbud cells (green trace follows cell marked by green arrowhead in B, gray traces are two additional cells from culture). Plotted in 2-min intervals. (E) Plot of Her1-YFP (black) and H2A-mCherry (red) signal intensity over time measured together from a representative cell. (EI). Nuclear YFP signal accumulates and degrades over time, as shown in the overlay of H2A-mcherry signal (red channel) and Her1-YFP signal (green channel) during troughs (297, 372) and peaks (342, 402) in Her1 expression. mCherry signal in the nucleus is relatively constant. Plotted in 2-min intervals. (F) Plot of YFP intensity (a.u.) over time in a fully isolated tailbud cell within a single well of a 96-well plate. Plotted in 2-min intervals. We next used our primary culture protocol (Webb et al., 2014) to generate low-density cultures of tailbud cells from multiple Looping tailbuds, which were recorded for 10 hr. In identical culture conditions to the explanted tailbuds, most individual cells that expressed Her1-YFP displayed a few pulses that appeared to damp out early in the recording (N = 2 independent cultures, n = 52 total cells, median cycles = 2) (Figure 1—figure supplement 4; Figure 1—source data 1). Fgf is expressed at elevated levels in the tailbud and is proposed to play roles in maintaining an oscillatory progenitor state in the embryo (Dubrulle et al., 2001; Sawada et al., 2001; Ishimatsu et al., 2010; Niwa et al., 2007). In contrast to the serum-only treatment, when Fgf8b was added to part of the same cell suspension within a divided imaging dish, a persistent rhythmic behavior was observed (Figure 1—figure supplement 5). The number of cycles increased dramatically, spanning the recording interval and without altering the period (N = 4 independent cultures, n = 547 total cells; median cycles = 5; Figure 1—source data 1). An imaged field contained 15 to 20 cells (Figure 1B, black arrowheads) and more than 50% of these cells (321/547) had YFP signal (Figure 1B, Figure 1—source data 2). Typically, cells remained rounded and displayed blebs, as expected from early zebrafish progenitors in vivo and in vitro (Diz-Muñoz et al., 2010; Maître et al., 2012; Ruprecht et al., 2015). Cells from the same embryos cultured in parallel maintained tailbud marker expression (Figure 1—figure supplement 6, Figure 1—figure supplement 7), suggesting that under these conditions the cells retain a tailbud progenitor phenotype (Martin and Kimelman, 2010; 2012). For the remainder of the manuscript we focus on the Fgf8b-treated cells as a model to understand the properties of segmentation clock oscillators. From the 321 cells that were YFP-positive at the beginning of the recording, we first excluded from analysis any cell that moved out of the imaging field, died, or touched another cell either through movement or division at any point in the recording. From the remaining 189 autonomous cells, we observed rhythmic expression (two or more pulses of expression) in 147, which we term the low-density data set (Figure 1B–D; Figure 1—figure supplement 5; Figure 1—source data 2; Figure 1—source data 3). An illustrative imaged field is shown in Video 1. Although some cells continued to oscillate after division, analysis of these rare events was complicated by the tendency of the daughters to strongly adhere to each other, and is beyond the scope of this study. We found a distribution of periods (78.8 ± 15.3 min [mean ± SD from 442 cycles]) and amplitudes (Figure 1—figure supplement 8A,B). Importantly, we observed no systematic slowing in successive oscillations in our data suggesting that the cultures were stationary over this interval (Figure 1—figure supplement 8E). Low-density segmentation clock cells oscillate in vitro. Field of view containing cell in Figure 1B–C, highlighted by the red arrow. This field contains 18 cells in total, with 9 expressing YFP. We observed 5 cell divisions, the highest number in any experiment, including one non-YFP cell, 3 YFP-positive cells, which are excluded from analysis because of division, and one YFP-positive cell disqualified due to contact with another cell in the field prior to the division. The remaining 5 YFP-positive cells, including the highlighted cell, are part of the low-density data set. Total duration = 10 hr; Time interval = 2 min; field size = 410 x 410 μm; Scale bar = 50 μm. To rule out the possibility that oscillations in the YFP signal were influenced by focal drift, we recorded from individual cells co-expressing Her1-YFP and the nuclear marker H2A-mCherry. We found that the Her1-YFP signal co-localized with the nuclear mCherry signal, which did not oscillate (n = 8 cells, Figure 1E, EI) indicating that focal drift does not contribute strongly to changes in YFP intensity. Combined, these results show that cells from the zebrafish tailbud do not need cell-cell contact to maintain oscillations. Nevertheless, diffusible factors could be released rhythmically in these cultures and maintain oscillations. To test the ability of a fully isolated cell to oscillate, we used serial dilution to obtain and image single tailbud cells isolated in individual culture chambers. We found that these fully isolated cells can also sustain oscillations (N = 5, n = 10, period = 62 ± 21 min (mean ± SD), median cycles = 5) (Figure 1F; Figure 1—figure supplement 9; Figure 1—source data 1; Video 2). Isolated segmentation clock cells oscillate in vitro. Field of view corresponding to cell in top row of Figure 1—figure supplement 9. Total duration = 6.2 hr; Time interval = 2.14 min, field size = 205 x 205 μm, Scale bar = 50 μm. Together, these data reveal the existence of a population of autonomously oscillating cells from the zebrafish segmentation clock. Mechanisms of oscillation in zebrafish based on reaction-diffusion processes (Meinhardt and Gierer, 2000), and which rely on diffusion across the tissue and do not contain cell-autonomous oscillators, are therefore not supported by our results. In addition, in nearly all cases the period of individual cells is longer than that of the tissue, indicating a role for tissue-level processes in setting the period of segmentation. The oscillatory signal we observe from individual cells is reporting the state of a pace-making circuit component (Schröter et al., 2012). A remarkable feature of these oscillatory signals is their variability between cells in the population (Figure 1—figure supplement 5). We observe a spectrum of behaviors in the low-density data set including cells that start or stop oscillating during the experiment, cells that start and then stop, and stuttering rhythms where cycles are missed (Figure 2A). Plotting amplitude and period of consecutive cycles from the whole low-density data set indicate that amplitude displays a slow variation revealed by correlations (Figure 2B), while period does not show any appreciable correlation at this timescale (Figure 2C; Figure 2—figure supplement 1A–C). We did not find a correlation between the period and amplitude of each cycle (Figure 2—figure supplement 1D). Dispersed low-density cells show a variety of behaviors compatible with slow amplitude fluctuations. (A) Representative background-subtracted traces displaying different oscillatory behaviors: persistent oscillations, oscillations that initiate, stop, or start and stop within the recording time of 600 min. (B) Amplitude correlations in successive cycles from the Fgf-treated low-density data set (645 cycles measured from 147 cells) are shown as red squares. Blue crosses show correlations from the same data set with pairs of peaks drawn at random from the same list. Amplitude values are normalized to the mean of the data set. (C) Period correlations in successive cycles from the Fgf-treated low-density data set are shown as red squares. Blue crosses show correlations from the same data set with period values drawn at random from the same list. Period is normalized to the mean of the data set. (D) Left: Scheme defining amplitude and period and corresponding limit cycle illustrating fluctuations in μ and ω, which are parameters controlling amplitude and frequency, respectively. Middle: equation of the generic Stuart-Landau oscillator model, which describes the time evolution of phase θ and amplitude r of the oscillator. Right: illustration of the Hopf bifurcation showing how the limit cycle (blue circle) collapses and becomes a fixed point (blue dot) as μ changes from positive to negative values. (E) Simulated traces generated with the Stuart-Landau model with colored noise in parameter μ and white noise in the oscillator variables, showing behaviors corresponding to those observed in the data, compare to panel A. (F) Amplitude correlations in successive cycles from the simulated oscillator are shown in red squares. Blue crosses show correlations from the same data set with pairs of peaks drawn at random. (G) Period correlations in successive cycles from the simulated oscillator shown in red squares. Blue crosses show correlations from the same data set with inter-peak-intervals from pairs of peaks drawn at random. (H) Heat plot of the fraction of time spent oscillating as measured by number of peaks occurring over time given the median period observed in the synthetic data, as the variance and correlation time of colored noise fluctuations in μ vary. Oscillating fraction of time for the Fgf-treated low-density data set (Figure 1—figure supplement 5; Figure 1—source data 3) would be found in the shaded region of the heat plot. We adopted a theoretical approach to better understand these observations. We chose a generic Stuart-Landau (SL) model that describes the phase θ and amplitude r of an oscillator in the vicinity of a supercritical Hopf bifurcation (Figure 2D) (Strogatz, 1994). In this description, the amplitude of oscillations grows with the square of the distance to the bifurcation. Existing genetic regulatory network models possess supercritical Hopf bifurcations (Verdugo and Rand, 2008a; 2008b; Wu and Eshete, 2011), though the topology and parameter values of the pace-making circuit remain unclear (Schröter et al., 2012; Uriu et al., 2009; Lewis, 2003; Trofka et al., 2012). The SL description allows us to examine the effects of noise strength and correlation time on frequency and amplitude, neatly separated and in combination (Supplementary file 1). Amplitude fluctuations observed in the data occur on a timescale that is similar to that of the oscillator period, and could be the result of global changes in the cell state. Slow fluctuations in gene expression and signaling systems have been reported in a variety of systems (Süel et al., 2006; Sigal et al., 2006; Huang, 2009; Chang et al., 2008; Albeck et al., 2013; Aoki et al., 2013). We introduced slow fluctuations in the parameter μ that controls the amplitude of oscillators in the theory. Motivated by the lack of correlation between period and amplitude in the data (Figure 2—figure supplement 1D–I), we set the coupling between these processes to zero. Slow amplitude fluctuations can drive the oscillators in and out of the oscillatory state (Figure 2E; Figure 2—figure supplement 2), and introduce correlations in the amplitude of consecutive cycles that are comparable to the experimental data (Figure 2F). Interestingly, the trend to higher amplitude variance at higher amplitude values, and the existence of a low occurrence of high relative amplitude cycles are not captured by the theory. To describe period fluctuations and their weak correlation observed in the data we introduced an additive white noise in the variables of the oscillator (Figure 2C,G) (Supplementary file 1). Since oscillators move in and out of the oscillatory state, a key observable in both model and data is the fraction of the total time that a cell oscillates. We performed simulations over a range of values of correlation time and variance in μ and found a region in parameter space that corresponds to the behavior of isolated cells (Figure 2H). In contrast to these effects, changing the variance of the additive white noise did not affect the distribution of amplitudes, the correlations of amplitudes, or the fraction of the oscillating time (Figure 2—figure supplement 3). While these results cannot rule out potential cell-type differences in the population, the theory is consistent with a population of cells having the same oscillatory mechanism, captured during different time windows of their dynamics. Importantly, it provides for the first time an observation of the longer timescales of noise in the autonomous oscillations of cells from the segmentation clock, regardless of its source. We next compared the precision of the most reliable of the cellular oscillators to the precision of collective oscillations in the intact embryo. From the 147 cells in the low-density data set, we selected those cells with persistent oscillatory behavior, defined as cells exhibiting sequential peaks over 80% of the recording time (n = 54 cells; Figure 3—source data 1). We used a wavelet transform to extract the phase of oscillatory signals (Figure 3A). We then evaluated precision by means of the quality factor Q, defined as the ratio of the decay time of the autocorrelation function and the period of oscillations (Morelli and Jülicher, 2007). All time series were sampled using time windows of equivalent lengths (6.5 cycles) (Figure 3—figure supplement 1); this procedure and the observed distribution of Q values are described in Supplementary file 1. We found that persistent cells had a mean period of 78.3 min (Figure 3B, inset). This is consistent with the period inferred from the inter-peak intervals measured from the entire low-density data set. We calculated a median quality factor QP ~4 from the persistent cells’ oscillations (Figure 3B). Our analysis excluded dividing cells, and as cell division is thought to introduce phase noise in the time series (Delaune et al., 2012), the precision of dividing cells would be lower. (A) Quality factor workflow for time series analysis for an example persistent oscillator. Sub-panel 1: Background-subtracted intensity over time trace from a single tailbud cell (black) with phase (gray). Sub-panel 2: Wavelet transform of the intensity trace with cosine (light blue) of the phase information (gray). Sub-panel 3: Autocorrelation of the phase trace and fit (green) of the decay (for details see Supplementary file 1). The period of the autocorrelation divided by its correlation time is the quality factor plotted in B for each cell (blue). (B) Distribution of quality factors QP for persistent segmentation clock oscillators (blue; range 1–28, median 4.6 ± 5.8) compared to quality factors QE for the oscillating tailbud tissue in the embryo (red; range 1–117, median 10 ± 21). To compare between time series of different lengths we used sampling windows to calculate the quality factors, see theoretical supplement for details. Median values are indicated by dotted lines. Inset: Distribution of periods in single tailbud cells. (C) Estimation of tissue-level quality factor determined by measuring from an ROI placed over posterior PSM tissue in whole embryo timelapse of a single Looping embryo (Soroldoni et al., 2014). The intensity trace (black) and cosine (light blue) correspond to the average signal in the ROI over time. The period of the fit of the autocorrelation (green) divided by its correlation time is the quality factor plotted in B (red). (D) Distribution of quality factors for persistent segmentation clock oscillators (blue) replotted from B compared with the distribution of quality factors for circadian fibroblasts (orange; range 1–149, median 20 ± 27). Median values are indicated by dotted lines. Inset: Distribution of periods in circadian fibroblasts. (E) Precision decreases with increasing additive noise. Top panel, quality factor Q vs. variance σz2 of the additive noise, from numerical simulations (S30). Dots are the median value and error bars display the 68% confidence interval for 1000 stochastic simulations. Black line and shaded region indicates the median and the 68% confidence interval of persistent cells’ oscillations. Bottom panel, p-value of a two-sample Kolmogorov–Smirnov test vs. variance σz2. We test whether the persistent cells oscillations and the quality factors obtained from simulations come from the same distribution. In the absence of amplitude fluctuations σμ2 = 0, for σz2 = 0.486 we have Q = 4.6 and a p-value of 0.78. We compared the precision of persistent oscillators in vitro to the precision of the tailbud during an equivalent developmental time window using tissue-level oscillation data from embryos in Soroldoni et al. (2014). We calculated a median quality factor QE ~10 in the embryo (Figure 3B,C; Figure 3—source data 2). 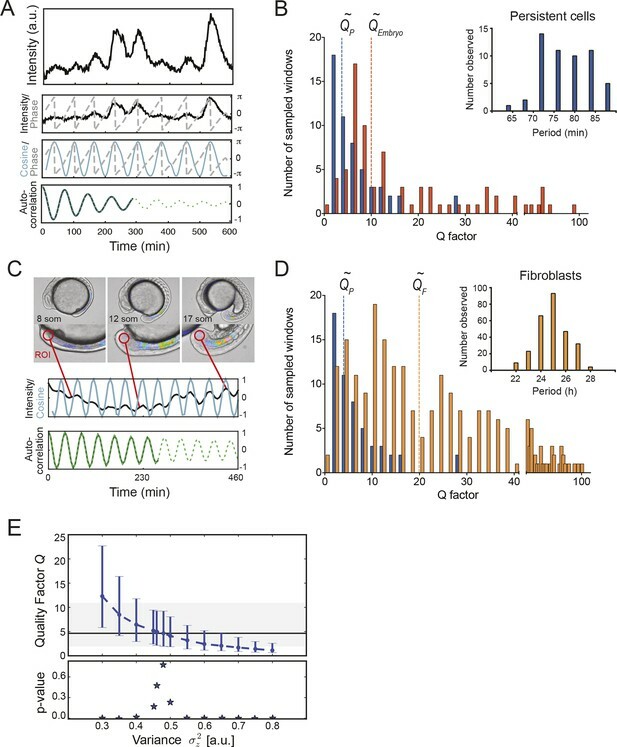 This value indicates that the precision of the tissue level oscillations in vivo is a factor of 3 times higher than the typical persistent segmentation clock cell in vitro. This suggests that in the embryo, coupling may increase the precision of the individual cells by a similar amount. Given that there are many cells with lower Q factor than the median, including those that were too noisy to be included in the persistent oscillator set, this increase in precision should be considered as a lower bound. To place the precision of persistent cells in context with another autonomous cellular oscillator, we analyzed the precision of the circadian clock using time series from single mammalian fibroblasts expressing a Period2-Luciferase reporter (Leise et al., 2012) and found these cells oscillated with a median quality factor QF ~20 (Figure 3D; Figure 3—source data 3). Thus, cells isolated from the zebrafish segmentation clock are less precise than the mouse circadian clock in single cells. We investigated the precision of simulated oscillators, comparing it to the experimental data. Noise in the parameter μ, which controls the amplitude and produced the heterogeneity of oscillator behavior discussed above, did not result in the observed range of quality factors (Supplementary file 1). In contrast, introducing white noise in the variables of the SL oscillator described the precision of the data (Figure 2D). This choice of noise was motivated by a lack of correlation in subsequent periods (Figure 2C,G). The experimentally observed precision of persistent cells from the segmentation clock was located within a restricted range of variance in this noise (Figure 3E). Together these data demonstrate a role for collective processes in increasing the precision of the tissue-level segmentation clock above that of the individual isolated cells. Our findings improve understanding of the segmentation clock at both single cell and tissue level. Single cell oscillators isolated from the zebrafish segmentation clock are autonomous. Nevertheless, tissue-level contributions aid in establishing the period and increasing the precision of segmentation. In zebrafish, inhibiting the Delta-Notch pathway that mediates synchronization between neighboring oscillators results in slower segmentation (Herrgen et al., 2010). This change in period has been interpreted as the result of losing the collective effects of coupling with delays (Herrgen et al., 2010; Morelli et al., 2009). An untested prediction of this scenario is that an individual isolated tailbud cell should slow when removed from coupling within the tissue. Our experiments allowed us to compare the period of the low-density cells to that of the explanted Looping tailbud cultured under the same conditions. We first noted that the period of the oscillations measured in tailbud explants (42.5 ± 11.4 min, mean ± SD) (Figure 1—figure supplement 3) was longer than the segmentation period in intact embryos of 27 ± 1 min (± SD) at 26°C (Schröter et al., 2008), a slowing of approximately 1.5-fold over the intact embryo. A comparable increase in period was not reported with explanted mouse tailbuds (Masamizu et al., 2006; Lauschke et al., 2012). However, a general developmental slowing of explanted zebrafish tissue has been previously reported (Langenberg et al., 2003). The reason for this is unknown, and likely involves chemical or mechanical differences in culture compared to the embryo. Recent studies of embryonic cell shape and migration have successfully utilized in vitro assays over minutes to tens-of-minutes time scales (Diz-Muñoz et al., 2010; Maître et al., 2012; Ruprecht et al., 2015), but the dynamics of longer-term zebrafish primary cell culture remains relatively unexplored (Westerfield, 2000). The differentiation of several lineages in primary cell culture appears to be slowed compared to the embryo, although this has not prevented the identification of relevant molecular regulatory mechanisms in this context (Xu et al., 2013; Huang et al., 2012). The zebrafish segmentation clock can maintain stable oscillatory output over a three-fold change in frequency due to temperature differences (Schröter et al., 2008), suggesting that its mechanism is robust to alterations in global growth conditions. Nevertheless, until the mechanism of this general slowing in vitro and its influence on the molecular and cellular processes within the segmentation clock are understood, we must remain circumspect in our interpretations. The period inferred from the low-density data set was approximately two-fold longer than that of explanted tailbuds using the same time series analysis (Figure 1—source data 1). This supports the expectation that coupling with time delays between segmentation clock cells in the zebrafish leads to a decrease in the period of the synchronized population (Herrgen et al., 2010; Morelli et al., 2009). However, the magnitude of the difference is larger than anticipated from the segmentation period of intact embryos with reduced Delta-Notch signaling, where the effect of delayed coupling was estimated at 20% (Herrgen et al., 2010). This difference may be due to additional, as yet unknown coupling pathways in the tissue, and/or to the existence of signals in the tissue that alter the base period with which the cell can tick, and which are diluted by the low-density culture. Our own observations with a range of Fgf8b concentrations indicate that it does not affect period (Figure 1—figure supplement 8D, and data not shown), suggesting that Fgf signaling is unlikely to be responsible. In this assay, rather than being instructive for the period of oscillations (Ishimatsu et al., 2010), Fgf appears to be permissive for the oscillatory state (Dubrulle et al., 2001). In summary, our results demonstrate that individual cells have a longer period than the period in the tissue. Thus, they provide independent support for a role for collective processes in determining the period of the tissue-level segmentation clock. A striking finding of our studies was the heterogeneity of oscillations across the population of cells. We propose that this heterogeneity can be described as the trajectories of self-sustained oscillators in the vicinity of a Hopf bifurcation. In this scenario, excursions across the bifurcation stop and start cycling behavior, but the underlying oscillatory mechanism remains. Fgf signalling appears to push the oscillators above this bifurcation, and the characteristic longer-timescales in the amplitude noise that we have observed may come from the inherent dynamics of the Erk network downstream of the Fgf receptor (Aoki et al., 2013; Albeck et al., 2013). One feature of oscillators in the vicinity of a bifurcation is that they may be more readily synchronized by coupling (Gonze et al., 2005; Barral et al., 2010). Individual cells from the mouse segmentation clock are also noisy, but the contribution of cell-cell signaling to maintenance of oscillations, either by contact or through diffusible factors, remains unclear (Masamizu et al., 2006). It is possible that in the mouse intercellular signaling may be required for sustaining oscillations, as has been observed for Delta-Notch signaling in neural progenitors (Imayoshi et al., 2013). Striking the optimal balance between autonomous and collectively-maintained oscillations could be a tune-able evolutionary strategy in developing multi-cellular systems. The relationship between cell intrinsic circuits, local cell communication and tissue-level patterns will be important for understanding development, as well as engineering strategies for synthetic cellular systems (Sprinzak et al., 2010; Matsuda et al., 2015). The Looping zebrafish line expresses a fusion of the Her1 protein and YFP driven by the endogenous her1 regulatory elements contained in a BAC transgene (Soroldoni et al., 2014). For tailbud explant cultures, intact posterior tissue including PSM and tailbud was dissected from transgenic zebrafish embryos between 5 and 8 somite stage. The ectodermal tissue layer was removed from the explant and discarded. Tailbud pieces were dissected away from the remaining PSM by making a lateral cut across the explant, just posterior to the base of the notochord and Kupffer’s vesicle (Figure 1A). Explants were then transferred to fibronectin-coated glass bottom 35-mm petri dishes (MatTek, Ashland, Massachusetts) and maintained in a small volume of L15 medium (Sigma, St. Louis, Missouri) with 10% fetal bovine serum (Invitrogen, Waltham, Massachusetts) during imaging. Cultures of tailbud cells were generated for in vitro imaging as described in (Webb et al., 2014). Briefly, tailbud explants were generated as described above. For each independent replicate, multiple tailbud pieces (each containing ~1000 cells) were pooled and incubated in trypsin/EDTA (Sigma) for 20 min at room temperature. To quench trypsin, tailbud cells were dispersed into a small volume of L15 medium (Sigma) with 10% fetal bovine serum (Invitrogen) by pipetting, then plated onto a fibronectin-coated glass bottom 35-mm petri dish (MatTek) and allowed to adhere for 20 min Additional L15 medium containing 10% serum ± mouse Fgf8b (75 ng/uL; R&D Systems, Minneapolis, Minnesota) was added to the culture prior to imaging. For the 96-well plate format, serial dilutions of the cell suspension to a final volume of 2 microliters were plated into individual wells. Again, additional L15 medium with 10% serum and Fgf8b was added to each well prior to imaging. Using this strategy, about 50% of plated wells have a single cell. Imaging was performed as described in Webb et al. (2014). Briefly, transmitted light, YFP and mCherry images were acquired using an EM-CCD camera (Andor xIOn 888, Northern Ireland) fixed to an inverted widefield microscope with a 40x lens (Axiovert 200M; NeoFluor 40x, NA 0.75, Zeiss, Germany). The temperature of the imaging dish was maintained at 26°C using a Warner heating chamber (Harvard Apparatus, Cambridge, Massachusetts). Using iQ2 software, we acquired multiple fields within the dish over a 2-min interval and a 10-hr recording time. In each recorded field, we counted the total number of cells that were YFP+ out of all viable cells (n = 321 out of 547, 59%). We first disqualified from analysis YFP+ cells that moved out of the field (4%), came into contact with another cell or divided (14%), or were not viable at the end of the 10-hr recording time (7%). The remaining cells (34%) were tracked in transmitted light images using a region of interest (ROI) tool in Fiji (ImageJ, NIH). Average and maximum intensities across the ROI were then measured and interpolated across images with a customized plug-in (ROI interpolator [Soroldoni et al., 2014)]). Before peak detection, any low frequency trends in the baseline of these raw intensity traces were removed by subtracting a local background obtained by measuring signal next to each cell (Figure 1—figure supplement 2A). For each background subtracted cell trace, we detected peaks using a custom Matlab script that uses the findpeaks function. The algorithm first smoothens the time series and then detects local maxima (Figure 1—figure supplement 2A). Local minima are then found between pairs of maxima using the function min restricted to the time interval between successive peaks. Peaks are subsequently discarded if they are smaller than 0.1 times the dynamic range of the time series, or if they are too close (less than 40 min) to the beginning or end of the time series, see the example trace in Figure 1—figure supplement 2A. Period is estimated as the time interval between consecutive peaks (Figure 1—figure supplement 2B). Period estimates are discarded if their value is larger that 140 min, interpreting these events as elapsed time between disconnected peaks. Amplitude is defined as the average of the difference between a peak's height and its two adjacent minima, to take into account signal drifting during one cycle. Monoclonal antibodies were generated to the Ntla protein, the zebrafish T/Brachyury homolog, and to Tbx16, the product of the spadetail locus. 8 μg of Ntla (amino acids 1–261) or Tbx16 peptide (amino acids 232–405) fused to GST was injected into Balb/c mice; sera were screened via ELISA. Each antiserum with a positive signal was further tested for tissue-specific binding in 15-somite stage wild-type and mutant or morpholino-injected embryos. Hybridoma cell lines were produced from one mouse; antibodies were purified from the supernatants. The antibody with highest signal-to-noise ratio was used for experiments (Ntla, clone D18-4, IgG1; Tbx16, clone C24-1, IgG2a). The validation of these antibodies is shown in Figure 1—figure supplement 6. Cell dispersals from the same cell suspension used for time-lapse imaging (L15 medium, plus 10% serum and Fgf8b) were cultured separately on Conconavalin-A (Sigma) coated glass bottom dishes (MatTek) and maintained in the incubator at 28°C. These cells were fixed in 4% paraformaldehyde (Sigma) after 5 hr in culture overnight at 4°C. Prior to staining, cells were washed 4 × 5 min in PBS at room temperature and then blocked for 1 hr at room temperature in a PBS solution containing 1% BSA and 0.1% Triton (Sigma). For staining, cells were incubated with monoclonal antibodies for Ntla (D18, IgG1) and Tbx16 (C24, IgG2a) (1:5000) overnight at 4°C. Primary antibody was removed and the cultures were washed 3 × 20 min in PSM at room temperature. Cultures were incubated in secondary antibodies GFP-anti-IgG1 and Cy5-anti-IgG2a (1:500, Molecular Probes, Eugene, Oregon) for 2 hr at room temperature, prior to DAPI staining and final washes (Figure 1—figure supplement 7). These data were generated and published in Leise et al. (2012) and kindly donated for analysis. We use wavelet transforms to generate a phase time series from the raw traces. We compute the autocorrelation function of this phase and fit it to obtain an estimate of the period T and correlation time tc, which allows us to compute the quality factor Q = tc/T (Supplementary file 1). The observed behavior can be described using a Stuart-Landau model, which captures the generic behavior of an oscillator close to a supercritical Hopf bifurcation that gives rise to sustained, limit cycle oscillations. We introduce slow fluctuations in the parameter that controls the distance to the bifurcation to capture amplitude fluctuations, and white noise in the variables of the oscillator to capture frequency fluctuations (Supplementary file 1). Proceedings of the National Academy of Sciences of the United States of America 107:8079–8084. Journal of Theoretical Biology 58:455–476. Proceedings of the National Academy of Sciences of the United States of America 101:10955–10960. Journal of Theoretical Biology 252:574–585. Journal of Biological Rhythms 19:35–46. The International Journal of Developmental Biology 49:309–315. Proceedings of the National Academy of Sciences of the United States of America 103:1313–1318. Journal of Cell Science 1986:357–381. Journal of Theoretical Biology 257:385–396. Communications in Nonlinear Science and Numerical Simulation 13:235–242. Communications in Nonlinear Science and Numerical Simulation 13:1112–1120. Proceedings of the National Academy of Sciences of the United States of America 106:16493–16498. Journal of Visualized Experiments pp. 1–8. Communications in Nonlinear Science and Numerical Simulation 16:1073–1088. Thank you for choosing to send your work entitled "Persistence, period and precision of autonomous cellular oscillators from the zebrafish segmentation clock" for consideration at eLife. Your full submission has been evaluated by Janet Rossant (Senior editor), Tanya Whitfield (Reviewing editor and reviewer), and two additional peer reviewers, and the decision was reached after discussions between these individuals. Based on our discussions and the individual reviews below, we regret to inform you that your work will not be considered further for publication in eLife. The reviewers agreed that the study is interesting and has been done carefully, but they had significant concerns over the fit of the experimental data to the model, and the extent to which the analysis provides a true advance in our understanding of somitogenesis in vivo. Although the study uses a larger number of cells than in previous work on similar systems, it was felt that the main findings are unsurprising and largely confirm those of earlier studies. It was also felt that, should a link to in vivo data be made (as suggested by Reviewer 3), this was also likely to confirm work that has already been done, and so would be unlikely to add further understanding. The full reviews are appended below. This study tests the proposal that the zebrafish somite segmentation clock is characterised by autonomous cellular oscillators, which have been proposed in other studies to be present and coupled by Notch signalling. This question has been tackled before in other species (chick, mouse), although in these previous studies, a very few dissociated cells were studied as part of a cell suspension (Masamizu et al.) or were pooled for analysis (Maroto et al.). The current study provides an advance over these previous studies, as the authors have examined much larger numbers of dissociated cells within a low density suspension than in previous studies, enabling a much more thorough quantitative and statistical analysis of the data. The authors also examine a small number of cells that have been isolated completely, and show (for a small number of cells) that oscillations can occur autonomously under these conditions. Overall, the study appears careful and thorough and will be an important addition to the literature in this field. The experimental detail is sometimes a little sparse and more information could be added for clarification – see specific comments below. In addition, the figure legends need careful revision, as there is confusing mislabelling in several places. 1) The period of individual cell oscillations at 26°C (81 min) is much longer that the value that is stated to be the period of trunk segmentation in intact embryos (27 min), measured tissue explants from the Looping Tg strain (55 min) and the authors' predictions (40 min) (subsection "Inferred period of segmentation clock cells in vitro”). This needs further explanation and discussion. What is the genetic background of the Tg strain? This is not described in the Materials and methods. The authors should include a measurement of the period of trunk segmentation in intact Looping Tg strain embryos as well as the explants, rather than merely comparing to previously published work (albeit from the same group, but done in a different laboratory etc.). 2) Little information is given about the health and other characterization of the cells in the low density suspensions. In the videos, they appear to show a lot of blebbing activity – is this expected? Do they retain other characteristics (e.g. gene expression) of the PSM and are they able to divide? It would be helpful to have some more information about the general behaviour of these cells under the conditions of the experiment. 3) What happened to the cells that touched each other? Do pairs of cells in contact with one another synchronise their signalling, or oscillate with a shorter period? Is there a community effect, and what is the minimum number of cells in a group that is sufficient to maintain faster and synchronized oscillations? 4) Fgf8b has been added to the culture medium to mimic conditions in the tailbud. What happens in absence of Fgf8b? Are there oscillations at all? Or damped oscillations? or oscillations with even longer periods? 5) The legend to Figure 1—figure supplement 1 is not sufficient to understand the figure. There is both a red and a grey line on each panel, but the legend confusingly only refers to a black line. (What is the grey line? – Background levels? – This should be stated somewhere.) I presume that the grouping of each set of traces refers to the independent replicates, but this is not explained anywhere. The 'smoothed' traces should be labelled as such on the figure. Also, the colour code is not correct – the smoothed traces are in red with blue circles to indicate peaks and troughs, not in blue with red triangles as indicated in the legend. Likewise, in Figure 1—figure supplement 2 and legend, the peak finding on the traces is actually labelled with red triangles, not blue as indicated in the legend; filtering appears to be labelled with blue triangles, not red as indicated. This lack of attention to detail has made it difficult and time-consuming to review the manuscript. 6) Figure 1—figure supplement 6 – these traces show timecourses for 10 individual isolated cells. Have these data been subjected to the same smoothing, peak and trough analysis etc. as the data from the low density set? Do they behave in a similar way? The manuscript presents a very worthwhile data set, detailing time-course expression profiles for a Her1 reporter with high temporal resolution. These show a high degree of variability, and a range of analyses are performed to extract phase and amplitude data. The authors go on to compare these summary measures to those obtained from a generic model of a system close to a supercritical Hopf bifurcation (at the boundary between decaying and sustained oscillations). They show that reasonable (though not perfect) agreement between the two sets of measures (experimental and simulated) can be achieved for an appropriate set of model parameters. These results are interesting in their own right, as a careful investigation of the nature of the time-courses obtained from the cultured tailbud cells. I'm less convinced that they say anything particularly important about somitogenesis in zebrafish. My primary concern here is that the Her1 expression observed in the low-density cultured cells is so distinct to that observed in tailbud cells in an intact embryo. The period of oscillation in vivo is 27min; the mean period extracted from the time-courses of the cultured cells is around three times as long as this (ca. 78min). The two sets of oscillations thus represent markedly different dynamics. 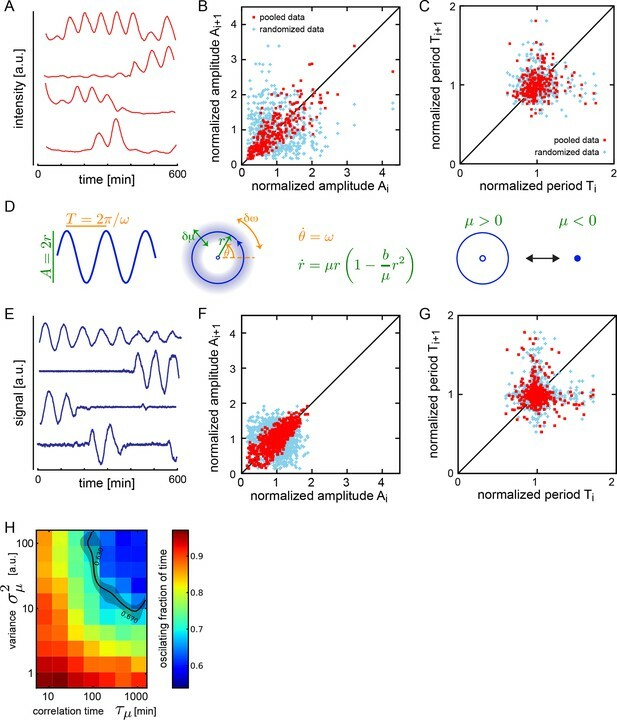 The long-period noisy oscillations observed in cultured cells may (or may not) be due to a dynamical system close to a Hopf bifurcation, but if they are, it is hard to see how this relates to a dynamical system based on the same components oscillating in a tissue with almost three times the frequency! The key observation in this regard is that the somitogenesis period in explanted PSM is around 55min, rather than the 27min in the embryo at the same temperature. This is reported in this manuscript without any real discussion. But surely this is a striking and potentially important result. My overall assessment is that the data set and data analysis are high quality and worthy of publication. The potential fit to a very generic model is also interesting, but I'm not convinced that the fit is actually that good. Given the large discrepancy between the cultures and the embryo, I'm not convinced that the data have much to say about somitogenesis. 1) Fgf8b was added to the culture medium "to mimic the signaling environment of the tailbud". Was this necessary to see oscillations in Her1-YFP levels? What happens if it is not added? 2) Did cells in culture never divide? This is not mentioned (other reasons for discounting time-courses are mentioned). Cells in the tailbud typically undergo a single division at around 15-16hpf (see Figure 1C in Bouldin et al. (2014). Genes & Development, 28, 384-395.) It seems that this division should fall within the time window of the current study. Are the culture conditions blocking this division, and if so, might that be expected to affect the oscillations? 3) The authors state (subsection “Heterogeneity in the population of oscillating cells”) that the simulated data are "in good agreement with the experimental data (Figure 2F)" However, Figures 2B and 2F don't match very well, as noted by the authors themselves in the next sentence. There is clearly more overall variability in amplitude in the real data (2B) than in the simulated data (2F), though the correlation of neighbouring peak amplitudes is similar. So the data show similar short-time coherence of amplitude to the model, but significantly greater variability in amplitude overall. 4) The data do appear to support the idea that the main variability in the oscillations is in the amplitude rather than in the period (Figures 2B, 2C). The authors use this finding to focus their attention on a S-L model with q=0 (so, the frequency is independent of the amplitude). This restricts the type of supercritical Hopf bifurcation that could underlie the observed oscillations (the normal form does not require q=0). Does this restrict the possible molecular mechanisms underlying the observed Her1 oscillations? In particular, do noisy negative feedback oscillators behave in this way? It is my understanding that stochastic simulations of negative feedback circuits (like the ones alluded to by the authors) that exhibit sub-Hopf stochastic resonance do show amplitude-dependence of the period (increased amplitude leads to increased period). Furthermore, the authors have previously shown that the use of the Her1-Venus transgene increases the period of oscillations. Is this likely to be due to the overall increase in expression level of Her1 in the Looping line? The amplitude-dependence of period (or lack of it) is potentially important for the tissue-wide oscillations observed in the PSM, as the value and distribution of q is an important factor in the ability of oscillators to synchronise. Webb et al. 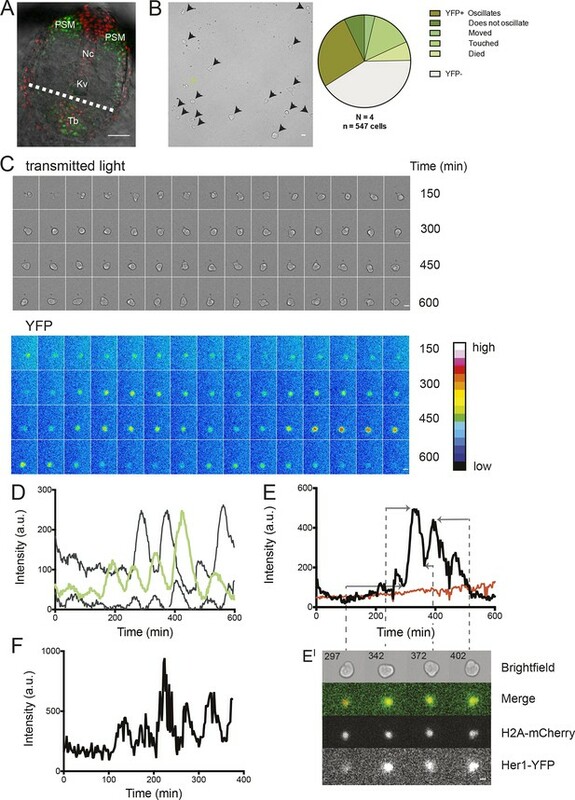 describe segmentation clock oscillations of individual dissociated zebrafish tail bud cells. They find that oscillations are present in vitro (as expected), but that the period is longer than in vivo (as previously postulated but shown here for the first time). A noise model can account for the degeneration of oscillations. The data is interesting for zebrafish researchers but I am not convinced that it goes beyond previous studies in chick and mouse. It seems straightforward to compare the in vitro oscillations to the in vivo oscillations in Notch signaling mutants. This experiment would test if the differences in vitro can be explained by the absence of Notch signaling. Thank you for resubmitting your work entitled "Persistence, period and precision of autonomous cellular oscillators from the zebrafish segmentation clock" for further consideration at eLife. Your revised article has been evaluated by Janet Rossant (Senior editor) and three reviewers, one of whom, Tanya Whitfield, is a member of our Board of Reviewing Editors. The reviewers agree that the manuscript has been improved and that the study is a significant advance over previous work. Although several unanswered interesting questions remain, the study will be valuable in stimulating discussion and research in this area. However, there are also some concerns. The first, outlined by Reviewer 2, is that the oscillations you describe in single cells do not necessarily represent the 'segmentation clock' itself. This may require some re-wording or further discussion in the manuscript. The second concern, highlighted by Reviewer 1, relates to the cell division rate in your cultures. This is perplexing, as the video that you show illustrates a mitotic index an order of magnitude higher than the value you state for the study overall (5/18 cells dividing in this field of view = 28%, whereas you state that the rate overall is only 2%). As your cells are drawn from a dividing progenitor population, and Fgf8 (a mitogen) has been added to the culture, it would be expected that the cells continue to divide, and it is reassuring to see them do so. However, the discrepancy between this and your description makes it difficult to have confidence in the numbers of dividing cells stated in the manuscript. Since this has implications for interpretation of the dataset as a whole, it is important that this is addressed. Firstly, and also with respect, I would like to clarify that I did not state that the previous manuscript was 'only a technical' advance over previous work; in fact, this part of my review was a positive comment in support of the paper. The authors have addressed all the points that I raised, most of them very satisfactorily. I think the argument is clearer and that the additional data (e.g. maintenance of marker expression) help with the overall interpretation. My one remaining concern relates to the issue of dividing cells in the low-density dataset. It is helpful that the authors have given more detail on cell divisions in a source file, and I appreciate the argument that the focus of the study is necessarily on the single cells. However, more explicit information is still needed here, especially for Video 1. The legend to Video 1 indicates that it corresponds to the field of view for the non-dividing cell in Figure 1B, C. It would help to mark the cell of interest (e.g. with a ring or arrowhead) at the start of the video. Otherwise, the text in the fifth paragraph of the subsection “Oscillations in isolated segmentation clock cells in vitro”, leads the reader to think that Video 1 is illustrating a whole field of cells that do not divide. More importantly, however, in addition to the non-dividing cell in the lower left, Video 1 also includes no fewer than five clear examples of cell divisions, four of them YFP+ (at 00.26 (top right and lower right), 00.30 (middle left), 00.33 (extreme top right) and 00.41 (bottom right)). I find this very surprising, given the source data file (Figure 1—source data 2), which documents only 9 instances of cell division in the entire dataset from a total of 29 fields of view, which would suggest that cell division events are rare. The observation of five division events in a single field of view also suggests that Video 1 is not representative of the dataset as a whole, and is directly contradictory to the statements in the rebuttal that 'it seems that culture conditions are inhibiting division'; 'because of the very low rate of cell division in the culture' etc. In short, I am not confident that the authors have measured the rate of cell division accurately in their cultures. Further explanation is required here. As the authors have pointed out in their rebuttal (although I could not find this in the manuscript), the pairs of daughter cells remain attached to one another. As far as I can see, there does not appear to be a consistent timing of division relative to the phase of the oscillation between the three examples, or maintenance of synchrony between daughters within a pair, although oscillation in at least one daughter can clearly continue after division. For example, after the division at 00.30, the daughter on the left of the pair has a very clear YFP peak at 00.39-00.40, while its sister on the right has very low YFP signal at the same time point. Since the dataset captures this very interesting information, it deserves some comment, even if a full analysis is beyond the scope of the current study. For cells that did divide (including the four YFP+ cells shown in Video 1), were oscillations measured up to the point of division, or were these cells eliminated from the analysis altogether? The text is not altogether clear on this point. I continue to believe that the data described in this manuscript are interesting and valuable, and I think it is very positive that the authors are making the raw data available to allow others to analyse them (although I maintain that the authors have done a good job of this already). The authors have addressed my queries and concerns. The additional data, and provision of raw data, make it easier to assess the validity of the statements made in the manuscript. I have one remaining niggle with the conclusions drawn from the data and the corresponding nomenclature employed by the authors. The cells are derived from the tailbud and maintain tailbud markers (new data). The cells certainly exhibit oscillations, which have features that are consistent with an underlying dynamical system that is close to a Hopf bifurcation. So it is fair to say that the cells are oscillators. However, I remain to be convinced that these facts are sufficient to call the cells "single zebrafish segmentation clock cells" (e.g. sixth paragraph of the Introduction and many other places). The segmentation clock is surely a coordinated tissue-wide oscillatory operating in the tailbud/PSM. A parsimonious (though not necessary) explanation of the findings reported is that the segmentation clock results from the interaction of some noisy cell-autonomous genetic oscillators. But that is not sufficient to call the oscillations in the single cells in vitro a "segmentation clock". I accept the argument that the period of the in vitro segmentation clock can exhibit marked temperature-dependence. But that does not lessen the difficulty of arguing that if a cell-autonomous oscillation in tailbud-derived cells is borderline-Hopf with a period of ca. 80min, then the in vivo clock, with a period of ca. 27min, has something to do with borderline-Hopf dynamics. I maintain that I do not think it is easy to explain how an oscillatory mechanism can be close to a Hopf bifurcation at two radically different periods. It may be that the mechanisms underlying the observed in vitro cell-autonomous oscillations and the in vivo segmentation clock are closely related (and it is probably true), but that does not mean that their dynamics are similar. Just because cells can oscillate in two different conditions does not mean that one can say that the oscillations are two different versions of the same thing. In summary, I like this study. I think the in vitro oscillations are interesting and the analysis is powerful. I just don't like the idea of calling these oscillations a segmentation clock – that is what operates in the embryo. Webb et al. have revised their manuscript to more clearly explain the limitations of previous studies in concluding that cell-autonomous oscillations form the basis of the segmentation clock. The differences between single cells, tissue explants and in vivo tail buds are striking but unexplained. The paper is a nice technical advance but the main conclusions were expected from previous studies, and the most interesting phenomena of different periods in vitro and in vivo remains unaddressed. Reviewer #1: This study tests the proposal that the zebrafish somite segmentation clock is characterised by autonomous cellular oscillators, which have been proposed in other studies to be present and coupled by Notch signalling. This question has been tackled before in other species (chick, mouse), although in these previous studies, a very few dissociated cells were studied as part of a cell suspension (Masamizu et al.) or were pooled for analysis (Maroto et al.). The current study provides an advance over these previous studies, as the authors have examined much larger numbers of dissociated cells within a low density suspension than in previous studies, enabling a much more thorough quantitative and statistical analysis of the data. The authors also examine a small number of cells that have been isolated completely, and show (for a small number of cells) that oscillations can occur autonomously under these conditions. It is possible that these experimental papers were selectively interpreted by the field in the light of the earlier theoretical models, and the idea that this has somewhere been shown experimentally appears now to be widely believed. We take some space below to detail the evidence and claims of these two important papers. Masamizu et al., 2006: In this study the first real-time reporter of the segmentation clock, a luciferase reporter of Hes1 expression in mouse, allowed single PSM cells to be observed in vitro. However, the arguments in this paper about oscillations and autonomy need to be treated with caution. The authors first state (p1314) “It was previously shown that expression of the chick homolog c-hairy1 oscillates even in dissected PSM fragments, suggesting that this oscillator functions in a cell-autonomous manner (7, 19).” This is mistaken reasoning by the authors, since this result says nothing at all about cell- autonomous function, only whether the PSM needs to be intact or needs a neighboring tissue to oscillate. The result is equally consistent with cell-autonomous and cell non-autonomous oscillations. When introducing the PSM dispersal experiments, the authors write: “It was recently shown that dissociated PSM cells also become out of synchrony (19).” But, this is a conclusion that the authors of reference 19 (Maroto et al.,) did not feel confident about, as discussed above. They continue: “However, it is not clear whether each PSM cell has a stable oscillator but is reset at various phases when dissociated or has an unstable oscillator, like fibroblasts. We thus next examined Hes1 oscillation in dissociated PSM cells.” In this latter passage Masamizu assume that the cells oscillate, and couch their description in these terms. The entire PSM except S0 was dispersed in 100% serum and cells were plated on poly-L lysine glass bottomed wells. The density of plating was not stated, and it was not reported whether cells were touching neighbors during the course of the recording. It is not stated how many cells were imaged, but expression from only 3 cells was reported, each showing 4 expression pulses with variable duration and steeply decreasing amplitude (Figure 4 D, E). The original location of these cells in the PSM prior to dispersion is not known, nor how frequent this behavior is amongst the cells in culture. A period was given as 155 ± 6 min in the text, however, it was not stated how this was calculated. It is difficult to see how this data supports the idea that mouse PSM cells are sustained autonomous oscillators. Importantly, Masamizu never use the phrase “cell autonomous” to describe their own data. Our reading of Masamizu is that they have probably filmed rare events of PSM cells rapidly damping out oscillations, in a cultured field of otherwise non-oscillatory cells. Consistent with this interpretation is the absence of any study in the last 10 years using any of the various mouse reporter lines to show potential cell-autonomous properties of the oscillators. In summary, Masamizu’s study proposes that PSM cells may be “unstable oscillators”, and highlights the role of inter-cellular signaling in maintaining and coordinating oscillations in vivo. Reflecting this perspective, their mathematical model of the process did not contain a sustained oscillator. Instead, the formalism is an example of an excitable system where the expression pulses are initiated by fluctuations or by signals from neighboring cells (Figure 5). It is not our place here to be overly critical of Masamizu, as this paper was a landmark in the field because of the live reporter. However, it is important to point out exactly the strengths and limitations of their study, and to be clear about what sort of evidence is there, what sort of conclusions can be reasonably drawn, and what remains an open question. In our revised version, we have significantly modified the Introduction to more carefully describe the data from these papers and their context in the literature. We agree that this aspect of the manuscript was confusing. In response to this comment and to comment 2 and 4 below, and to very similar to comments by reviewer 2 (concerns 1 and 2), we decided to fundamentally reorganize the beginning of the Results section, and to include new experiments. We replaced the original estimates of period differences with a direct measurement of the difference between the period of the explanted tissue and the separated cells. Importantly, we combine this with describing the step-wise isolation of the cells, documenting the changes at each step from explanted tissue to isolated cells. We hope that this better illustrates the connection between the different samples, and also makes it clear exactly at which steps differences in the period appear. Note that we cannot yet explain all the differences, but we hope the new manuscript allows the reader to better understand what is known. We include a new experiment in which we explanted and grew the tailbuds from Looping embryos in similar culture conditions to the isolated cells. These explants show persistent oscillations, but with a longer period than the intact embryo (Figure 1—figure supplement 3). We next describe the dispersed individual cells from the tailbuds in identical conditions, and show that most show very few cycles (median 2) with a twofold longer period before damping out (Figure 1—figure supplement 4). Motivated by the elevated level of FGF in the tailbud in vivo, we next describe the addition of Fgf8b to the cultures. This does not further change the period, but dramatically increases the number of cycles to a median of 5 (Figure 1—figure supplement 5). In addition, we have included a spreadsheet in which the raw and background-subtracted data from all low-density oscillating cells is presented so that other researchers may analyze this in detail (Figure 1—source data 3). The results from each time series analysis are presented in table form in Figure 1—source data 1. Thus, explanting slows the tissue period about 1.5 times, and dissociating the cells from the tissue slows them about 2-fold. We do not understand the origin of the general slowing in culture, but we comment on the fact that this has been previously noted by others, and propose that some general property of culture may be responsible. We also point out that primary culture studies for zebrafish is in its infancy in the literature, particularly with respect to dynamics, and that obviously more work needs to be done. 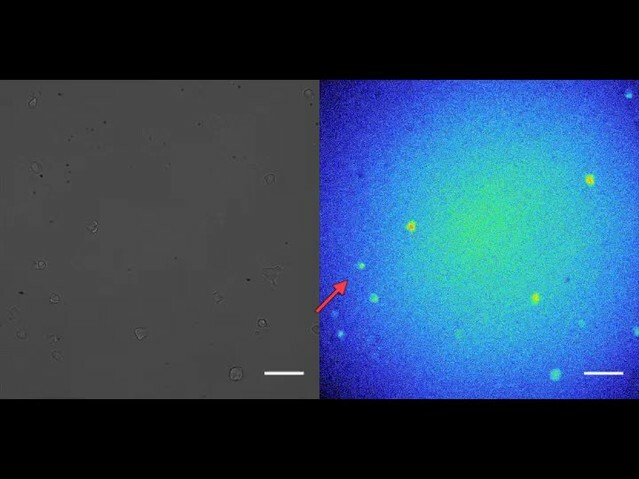 A slowing of individual cells due to separation from the tissue was predicted by previous work, and we see this, but the observed magnitude is higher than expected. This is actually quite exciting, and forces us to propose the existence of a second, as yet unknown coupling system and/or a constitutive factor that elevates the period, but is lost by diffusion when the cells are separated (but is obviously not FGF). We have added text to introduce and explain the transgenic line, which was generated in Soroldoni et al., (Science 345, 222–225, 2014), in a timely manner at the beginning of the Results and information in the Materials and methods. The new Results subsection (“Oscillations in isolated segmentation clock cells in vitro”) describes the step-wise dissociation, the observed periods, and additional measures of the cells’ properties (shape, division, gene expression etc.). We have removed the previous Results section that focused on the calculation of differences in estimated period, and have instead included a discussion of the period differences in the subsection “Heterogeneity in the population of oscillating cells”. Please also see our response to reviewer 2, below. is this expected? Do they retain other characteristics (e.g. gene expression) of the PSM and are they able to divide? It would be helpful to have some more information about the general behaviour of these cells under the conditions of the experiment. From previous work done in the Heisenberg, Paluch and Raz lab, embryonic cells of several zebrafish lineages show blebbing phenotypes both in the embryo and in culture (Diz-Munoz et al., PLoS Biol. 8, e1000544, 2010; Maitre et al., Science 338, 253–6, 2012; Ruprecht et al., Cell 160, 673–685, 2015), so we think this is a normal phenotype. We have added information about this in the fourth paragraph of the subsection “Oscillations in isolated segmentation clock cells in vitro”. We have included experiments investigating the expression of PSM genes. We examined whether the cells in our cultures express No tail (Ntl, a zebrafish homolog of Brachyury), a well-established marker of the posterior progenitor population (Martin and Kimelman, Genes Dev. 24, 2778–83, 2010) and Tbx16 (Spadedtail), a marker of tailbud and posterior PSM (Martin and Kimelman, Dev. Cell 22, 223– 32, 2012). Polyclonal antibodies to these proteins had been previously published (Schulte-Merker et al., Development 116, 1021-1032 (1992); Amacher et al., Development 129, 3311-3323 (2002)), but these reagents are limited or exhausted. Therefore, in the revised version of this paper we now describe the generation and validation by our group of two new monoclonal antibodies to these proteins in a new supplement (Figure 1—figure supplement 6). During the original experiments that form the core of the manuscript, we had split the starting material: one part was imaged as reported in the manuscript, the other part was cultured in parallel and then fixed at later time points and immunostained for Ntl and Tbx16 protein. We found that 81 out of 114 cells across 10 fields of view in the culture had either elevated Ntl and/or Tbx16 staining in their nuclei after several hours of culture. Since Ntl and Tbx16 expression is lost as cells move into the anterior PSM, this finding argues that many of the cells in culture have maintained a relatively posterior progenitor state. The dissection of the tailbud posterior to the end of the notochord (see Figure 1A and Figure 1—figure supplement 1) is expected to recover cells of the neural plate, skin, endoderm and lateral plate mesoderm, in addition to cells of the PSM. Approximately 60% of the cells express Her1- YFP in culture (Figure 1B), and we therefore anticipated that ~40% of cells in the culture would not express markers of PSM. The finding that 71% of the cells express Ntl or Tbx16 is consistent with most or all of the Her1-YFP positive cells expressing these posterior markers. We have included information about the expression of Ntl and Tbx16 protein in the embryo and in vitro as a new supplement (Figure 1—figure supplement 7), and included text to summarize these findings in the fourth paragraph of the subsection “Oscillations in isolated segmentation clock cells in vitro”. Summary information for each Fgf8b experiment in the current manuscript is provided in table form (Figure 1—source data 2), and includes the number of expressing cells, cell survival, cell division, etc. Cells that underwent division during the recordings had been previously included in the touching category, because these cells tend to remain in close contact (see below: reviewer 2, point 2), but in response to requests by reviewers 1 and 2, we have now separated these cells, creating a category of dividing cells. The frequency of dividing cells is low ~2%. We appreciate these interesting questions, but this was not measured systematically in our movies. The main problem was that the cells that touch each other usually crawled on top of each other, making it difficult to distinguish between each individual cells using wide-field imaging. We are currently exploring different culture, labeling and imaging options to address this question directly and argue that such an analysis is outside the scope of this study. The effect of Fgf8 was raised also by reviewer 2 (concern 1). Tailbud cells in our culture oscillate without Fgf8b, also with a range of oscillatory phenotypes, but with many fewer peaks on average. These peaks tend to occur at the beginning of the recording, and in most cases appear to damp out. To document this, we have added to the revised version traces from 52 cells from the same starting tailbud cell suspensions as reported in the manuscript (experiments 240711 and 250112), but recorded in a separate well of the divided dish without added Fgf8b. Peak counting analysis of these traces found a median of 2 peaks, in agreement with our previously published work defining the basic isolation and culture protocol (Webb et al., J Vis Exp (89) 2014), compared to a median of 5 peaks for Fgf8b-treated cells (Figure 1—source data 1). Although period estimates for the serum only cells are slightly noisier because of the fewer cycles, they are similar to those of cells treated with Fgf8b. This phenotype is consistent with the proposed role of FGF in the vertebrate tailbud as a factor that retains cells in a progenitor state (Dubrulle, J. et al., (2001). Cell, 106(2), 219–232. ; Diez del Corral, R. et al., (2002). Development 129, 1681– 1691). Rather than being instructive for the period of oscillations, FGF appears to be permissive for the oscillatory state and we have now included some discussion of this result in the fourth and sixth paragraphs of the Discussion, as it is a unique test of various hypotheses about the role of FGF in the embryo. Thus, the addition of Fgf8b to this culture system keeps the cells oscillating throughout the recording and allows us to observe more cycles per cell and improve period estimates. We have included this information now in a new supplement (Figure 1—figure supplement 4), compare the statistics of these cells directly in Figure 1—figure supplement 8, comment on the effects of FGF in the culture at the beginning of the Results section. 5) The legend to Figure 1—figure supplement 1 is not sufficient to understand the figure. There is both a red and a grey line on each panel, but the legend confusingly only refers to a black line. (What is the grey line? Background levels? This should be stated somewhere.) I presume that the grouping of each set of traces refers to the independent replicates, but this is not explained anywhere. The 'smoothed' traces should be labelled as such on the figure. Also, the colour code is not correct – the smoothed traces are in red with blue circles to indicate peaks and troughs, not in blue with red triangles as indicated in the legend. We apologize for the mistakes in the color referencing. We have revised the figure legend to accurately reflect the figure. Likewise, in Figure 1—figure supplement 2 and legend, the peak finding on the traces is actually labelled with red triangles, not blue as indicated in the legend; filtering appears to be labelled with blue triangles, not red as indicated. This lack of attention to detail has made it difficult and time-consuming to review the manuscript. Again, apologies for the mistakes in the color referencing. We have revised the figure legend to accurately reflect the figure. these traces show timecourses for 10 individual isolated cells. Have these data been subjected to the same smoothing, peak and trough analysis etc. as the data from the low density set? Do they behave in a similar way? We have updated this figure (now Figure 1—figure supplement 9) to show the raw, background-subtracted data with smoothing and with peak calling using the same basic analysis pipeline as the other time series. This is described in the figure legend. The statistics from these cells are now included in tabular form (Figure 1—source data) for comparison with cells in all conditions. Although the certainty associated with these values is lower because of the smaller sample size, the cells behave in a similar way. Reviewer #2: The manuscript presents a very worthwhile data set, detailing time-course expression profiles for a Her1 reporter with high temporal resolution. These show a high degree of variability, and a range of analyses are performed to extract phase and amplitude data. The authors go on to compare these summary measures to those obtained from a generic model of a system close to a supercritical Hopf bifurcation (at the boundary between decaying and sustained oscillations). They show that reasonable (though not perfect) agreement between the two sets of measures (experimental and simulated) can be achieved for an appropriate set of model parameters. These results are interesting in their own right, as a careful investigation of the nature of the time-courses obtained from the cultured tailbud cells. I'm less convinced that they say anything particularly important about somitogenesis in zebrafish. My primary concern here is that the Her1 expression observed in the low-density cultured cells is so distinct to that observed in tailbud cells in an intact embryo. The period of oscillation in vivo is 27min; the mean period extracted from the time-courses of the cultured cells is around three times as long as this (ca. 78min). The two sets of oscillations thus represent markedly different dynamics. The long-period noisy oscillations observed in cultured cells may (or may not) be due to a dynamical system close to a Hopf bifurcation, but if they are, it is hard to see how this relates to a dynamical system based on the same components oscillating in a tissue with almost three times the frequency! The key observation in this regard is that the somitogenesis period in explanted PSM is around 55min, rather than the 27min in the embryo at the same temperature. This is reported in this manuscript without any real discussion. But surely this is a striking and potentially important result. My overall assessment is that the data set and data analysis are high quality and worthy of publication. The potential fit to a very generic model is also interesting, but I'm not convinced that the fit is actually that good. Given the large discrepancy between the cultures and the embryo, I'm not convinced that the data have much to say about somitogenesis. We share with the reviewer the view that the slowing of segmentation in the explant is a striking and potentially important result. Of course, any in vitro model of an in vivo situation must be viewed with caution, and zebrafish primary cell culture is in its infancy, particularly when it comes to understanding dynamics. However, we disagree that the difference in period between intact embryo and individual cell is in itself a substantive problem with the in vitro model; we argue that the differences may allow us to begin to reveal and estimate the magnitude of key interactions present in the tissue that are missing in vitro. There are a number of points raised by the reviewer in the paragraphs above, which we attempt to clarify and discuss here, as well as describe the new experiments and revisions we made. 1) Comparison of period lengths. Given the previously noted slowing of development in explanted zebrafish tissue (Langenberg et al., Dev. Dyn. 228, 464–474 (2003)), we needed a more direct measure of this slowing to get a better comparison of the differences between the genetic oscillations in the tissue and single cell. We have therefore now added a new experiment in which we estimate period directly from the YFP signal in explanted Looping1 tailbuds (Figure 1—figure supplement 3, Figure 1— source data 1). We found a period of 42 minutes in the explant, which is about 1.5 times the longer than the period of segmentation in the intact embryo. When cells are dispersed from the tailbud explants in culture, the period lengthens approximately 2-fold (regardless of the presence of FGF). We argue this is a direct measurement of the difference between tissue-level and single cell oscillations in culture. An increase in period after dissociation was expected but its magnitude was not, so these new experiments provoked by the reviewers’ critiques may have revealed a new phenomenon. We speculate that this difference might be due to an as yet unknown additional source of coupling in the tissue, and/or a tonically-expressed factor in the tailbud that elevates the frequency in the tissue, but is diluted once the cells are dispersed. Please also see the detailed response to reviewer 1, substantive concern 1, above. Thus, the revised manuscript removes the lengthy and somewhat abstract comparisons of estimates in the Results, replacing them with measurements at the beginning of the Results, and a discussion of the differences at the end. 2) With respect to the more general point about whether a system can oscillate over a range of 2-3 fold in frequency using the same components, we would point out that changes in temperature cause the whole system to shift its frequency 3-fold, while generating a normally proportioned embryo (Schröter et al., Dev. Dyn. 237, 545–553, 2008). Such reliability at different temperatures and periods is likely advantageous for an embryo that grows up without parental care and is subject to a fluctuating environment. Although this hasn’t been examined in detail, we would be hesitant to say that the oscillations at one of the temperatures do not relate to the dynamics of the system at other temperatures. Whatever the changes to the biochemistry, these end up in the parameter omega for the frequency in the model. The model is used primarily to probe the noise in the data and doesn’t describe the changes in time-scale. Thus, we argue that the change in frequency is not in itself a problem for the model or interpretations. We don’t yet understand the 1.5-fold slowing in the explants relative to the intact embryo. Our hypothesis is that some general temperature-like factor is influencing the rate of development generally. It was reported that changes in O2 can slow zebrafish development and even temporarily arrest it (Padilla and Roth, 2001, PNAS 98(13):7331-5), so gas exchange may play a role. Alternatively, there may be some rate influencing metabolic factor that is normally available from the yolk that is missing in the explants, causing the tissue to use an alternate energy source with a lower flux, which influences the general developmental rate. We wish to investigate this slowing in the future, as it is indeed striking and could well be more generally important, but we have argued here that it should not present an insurmountable challenge to the current analysis and interpretation of the data. We are confused by the reviewer’s statements “…reasonable (though not perfect) agreement between the two sets of measures (experimental and simulated)” and “…I'm not convinced that the fit is actually that good”. It is rare that model and experimental data are in perfect agreement, and we are deliberately using a very simple model to try to tease apart the basic timescales in the noise. It would almost certainly be possible to add more complexity to the model (additional parameters), or change its structure altogether, and thereby improve the match between model and experiment (Note that in Figure 2, there is no fitting in the technical sense), but it is unclear what would be gained. Nevertheless, it is important to point out what the model did not do a good job of explaining, and in this respect we have revised the paragraph comparing model and data (see point 3 below). Substantive concerns: 1) Fgf8b was added to the culture medium "to mimic the signaling environment of the tailbud". Was this necessary to see oscillations in Her1-YFP levels? What happens if it is not added? See response to reviewer 1, specific comments 4, above. Cells divide during the recording, although this is at low frequency. This behavior was previously included in the “touch another cell” category, as after division the cells almost always stay in contact and crawl over each other, but Figure 1—source data 2 has now been revised to include the division category explicitly. The number of cell divisions we see is reduced relative to what was measured in vivo by Bouldin et al., 2014, and therefore it seems that the culture conditions are inhibiting division. Importantly, Zhang et al., 2008 (Cell cycle progression is required for zebrafish somite morphogenesis but not segmentation clock function. Development, 135(12), 2065–2070) examined the emi1 mutant zebrafish that lacks cell divisions after early gastrulation and concluded that the segmentation clock was normal. Bouldin showed that a heatshock of cdc25a expression increased the mitotic rate and prolonged Tbx16 expression, but did not present evidence about the effects of reducing division on differentiation. On this basis, we wouldn’t have expected that reducing cell division would affect the cells ability to oscillate per se. In any case, we have checked Tbx16 and Ntl expression in the cells of parallel cultures (as above) and found that expression is consistent with the tailbud. We argue therefore, that although the culture system appears to reduce cell division, this has not affected the differentiation state of the cells. From previous studies in the embryo (Delaune, E. A., et al., (2012). Single-cell-resolution imaging of the impact of Notch signaling and mitosis on segmentation clock dynamics. Developmental Cell, 23(5), 995– 1005), divisions were observed to introduce phase noise into the time series. Thus, our analysis, which excludes cells that divide, is likely to give a slightly higher measurement of precision than if we included dividing cells. Additionally, because of the very low rate of cell division in the culture, we argue that cell division cycle stage is unlikely to be a major contributor to the heterogeneity we observe. We have commented on these aspects in the first paragraph of the subsection “Precision of persistently oscillating cells”. Our choice of q = 0 was made partly for simplicity, and also based on some data that we didn’t present before, which is the correlation between period and amplitude – apologies for this. We have now included this plot in Figure 2—figure supplement 1 as panel D. The reviewer is correct to point out that in general when a system is reduced to its normal form close to a Hopf bifurcation, it requires a special non-generic symmetry to get one of the parameters = 0. Thus, we do not make any claim that the underlying system has this property; in general we expect that q would not be zero. However, with noise in the system, a small value of q can easily be blurred. We show this scenario in Figure 2—figure supplement 1 panels E-I, in which we examine the effect of noise on the SL model with known values of q. We also examined the behavior of the classical Lewis negative feedback model (Lewis, J. (2003) Autoinhibition with transcriptional delay: a simple mechanism for the zebrafish somitogenesis oscillator. Current Biology 13(16), 1398–1408). For this model also, using the parameters given in that paper noise can blur the correlation between the amplitude and period. We agree that using these new data to constrain and develop microscopic models of the segmentation clock, thereby probing the molecular mechanisms at the core of the clock is a very interesting prospect, but to do so will require a systematic examination of how different sources of noise affect the dynamics of the various models, as well as examination of various perturbations. We argue that this is a major new project, and outside the scope of the current paper. In the interests of furthering the utility of this data, we have now included a spreadsheet in which the raw and background-subtracted data from all low-density oscillating cells is presented so that other researchers may analyze this in detail and test against other theoretical descriptions (Figure 1—source data 3). The overall increase of period in the Looping line is unlikely to be due to the elevated levels of Her1 in the embryo. We have generated several independent lines with the same transgene and these express a range of levels, but have an identical period offset to wildtype (10 ± 2%) as the published Looping line. Reviewer #3: Webb et al. describe segmentation clock oscillations of individual dissociated zebrafish tail bud cells. They find that oscillations are present in vitro (as expected), but that the period is longer than in vivo (as previously postulated but shown here for the first time). A noise model can account for the degeneration of oscillations. The data is interesting for zebrafish researchers but I am not convinced that it goes beyond previous studies in chick and mouse. It seems straightforward to compare the in vitro oscillations to the in vivo oscillations in Notch signaling mutants. This experiment would test if the differences in vitro can be explained by the absence of Notch signaling. As described above, this study clearly goes well beyond previous work in mouse and chick. We are not aware of any report of reliable imaging and tracking of oscillations in tailbud cells, the subject of this manuscript, in an intact embryo. Delaune et al. (Dev. Cell 23, 995–1005, 2012) and Shih et al. (Development 142, 1785–1793, 2015) have reported oscillations of single cells in the bulk of the PSM, where cell movement in the tissue is very limited, enabling reliable semi-manual tracking over time. These cells are all systematically slowing their oscillations (Morelli et al., HFSP J. 3, 55–66, 2009; Shih et al., 2015) and are not the relevant comparison to our cell culture. In contrast, cells are moving rapidly in the tailbud (in x, y and z) (Lawton et al. Development, 140(3), 573–582, 2013). We have not yet been able (nor have other laboratories) to extract extended tracks on the timescale of several cycles that would enable a reliable estimate of the period of tailbud cells in the intact embryo. This is why we have considered the period of oscillations at the local tissue level instead (effectively averaged over many cells moving within the tailbud) where the measurements are reliable (Soroldoni et al., Science 345, 222–225, 2014). Note that this period would include the effects of local and tissue-level collective processes such as cell-cell coupling or diffusive signaling. Reviewer #1: Firstly, and also with respect, I would like to clarify that I did not state that the previous manuscript was 'only a technical' advance over previous work; in fact, this part of my review was a positive comment in support of the paper. The authors have addressed all the points that I raised, most of them very satisfactorily. I think the argument is clearer and that the additional data (e.g. maintenance of marker expression) help with the overall interpretation. My one remaining concern relates to the issue of dividing cells in the low-density dataset. It is helpful that the authors have given more detail on cell divisions in a source file, and I appreciate the argument that the focus of the study is necessarily on the single cells. However, more explicit information is still needed here, especially for Video 1. The legend to Video 1 indicates that it corresponds to the field of view for the non-dividing cell in Figure 1B, C. It would help to mark the cell of interest (e.g. with a ring or arrowhead) at the start of the video. Otherwise, the text in the fifth paragraph of the subsection “Oscillations in isolated segmentation clock cells in vitor”, leads the reader to think that Video 1 is illustrating a whole field of cells that do not divide. We have marked the cell of interest with an arrow at the beginning of Video 1, and we have re-written the legend to Video 1 to describe what is seen and how we processed the different cellular behaviors for analysis in the paper. We hope that this description, along with other changes (see below), will help to clarify the reported cell categories and to reduce ambiguity about the decision-making process. In summary: (1) we re-counted the same number of YFP-positive divisions as we had previously reported (2%); (2) a slightly larger number of YFP-negative cells are dividing throughout the experiments (5%); and (3) the field with the highest number of divisions (5) was indeed the field shown in the supplementary video. This means that Video 1 is not representative of the mean number of dividing cells per field in the data set as a whole, but if one calculates the approximate Maximum Load expectation for throwing 43 balls (cell division) into 29 pots (field of view), it’s ~4.5, so we don’t think a field with 5 events was unexpected. We argue to retain this video for illustrative purposes, with appropriate annotation, as it does give a nice, compact overview of the different behaviors that are seen in the experiment, as highlighted by Reviewer 1 (below). We hope that readers will find these interesting and it will stimulate future studies in the community. We have now revised the Results section, Figure 1B legend, and the legend of the movie to reflect these facts, and in particular to avoid giving the impression that the field is representative of the mean division rate per field in the entire data set. Results subsection “Oscillations in isolated segmentation clock cells in vitro”, fifth paragraph, Figure 1B legend, Video 1 legend. We have commented on the cells’ tendency to remain attached after division and the interesting observation that oscillations can continue after division in the Results section, subsection “Oscillations in isolated segmentation clock cells in vitro”, fifth paragraph. Any cell that divided at any point in the recording was disqualified from analysis. We now state this explicitly in the fifth paragraph of the subsection “Oscillations in isolated segmentation clock cells in vitro”. that is what operates in the embryo. Reviewer #3: Webb et al. have revised their manuscript to more clearly explain the limitations of previous studies in concluding that cell-autonomous oscillations form the basis of the segmentation clock. The differences between single cells, tissue explants and in vivo tail buds are striking but unexplained. The paper is a nice technical advance but the main conclusions were expected from previous studies, and the most interesting phenomena of different periods in vitro and in vivo remains unaddressed. We agree that the differences between single cell and tissue level activities are still not understood. We also agree that some theoretical studies gave expectations that are now supported by our work (and other theories are now disqualified), but we continue to argue that there was no previous experimental work of this kind, and that the experimental demonstration and characterization of the autonomous state is an important contribution. The authors would like to thank David Welsh for providing the fibroblast data set, Ravi Desai for assistance with widefield microscopy, and Ulrike Schulze for assistance with confocal microscopy, Daniele Soroldoni for general wisdom and abilities to discuss science while consuming alcohol, David Dreschsel and the MPI-CBG Protein Production Facility, Patrick Keller and the MPI-CBG Antibody Facility, the Oates lab for comments and discussion, and Philip Murray, Kim Dale, Saul Ares, Stephanie Taylor, Hanspeter Hertzel, Ravi Desai, Laurel Rohde and Caren Norden for comments on a draft of the manuscript. Animal experimentation: Zebrafish experimentation was carried out in strict accordance with the ethics and regulations of the Saxonian Ministry of the Environment and Agriculture in Germany under licence Az. 74-9165.40-9-2001, and the Home Office in the United Kingdom under project licence PPL No. 70/7675. © 2016, Webb et al.